I think the chatroom's welcome message should mention something about the /help command. Many players don't know there are commands and they don't know how to swap and block anons from games. I'm aware that typing /help tells you theres a command called /help you can type with gives you a lit of commands, but that kinda defeats the purpose of help. I also would like to see /help explain what the commands do rather than just list them. There we go N! Thats something that can be quickly changed, I like this idea. It shouldn't be majorly hard for Scott to do this, and it would help out the new players. To my knowledge, he would just have to modify the server coding a little, and put up a new server (It's currently Edge of Tomorrow). 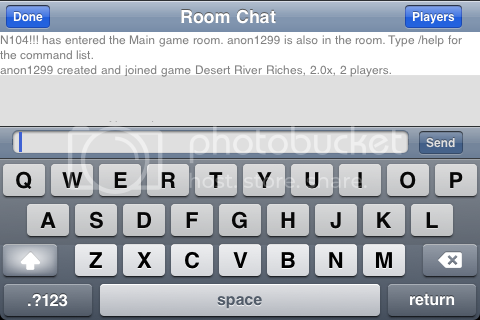 I will see if it can be done without causing the chat button to flash the moment you enter the room. If it can be done, I'll add a "message of the day" feature that can be set, so you see it when you enter the room (in addition to your request). I will see if it can be done without causing the chat button to flash the moment you enter the room. It would be a big troll if if it flashed as soon as you enter. Everyone would think they are lagging. f it can be done, I'll add a "message of the day" feature that can be set, so you see it when you enter the room (in addition to your request). A message of the day, that would be useful. It would make it possible to make announcements longer than a room title. Who would be able to modify the "message of the day"? Only you? all admins? Mods and admins? Another idea I have similar to this one would be that when a player enters the room, it would show them the rules in grey text. The reason why chatroom mods post the rules when a player breaks them is to make sure the player knows the rules (if they player didn't know the rules, they might have tried not to break them if they had known them) and give them a chance/warning. The issue is, sometimes it's hard to know what players know the rules and what players don't. So a lot of the times, mods post the rules when a player breaks the rules. The rules are 4-5 lines long, so it is more of a disturbance for a mod to post the rules than for a mod to give a small (1 line) warning. If players could be given the rules when the enter the room it would remove the need for mods to post the chatroom rules since players would already know the rules. In which case, a mod could just give the player a warning, knowing that the player is aware of the game's rules. That's a very good idea, alot of other games have that kind of thing. N104!!! has entered the Main game room. anon1263, anon1267, and anon1275 are also in the room. N104!!! has entered the Main game room. anon1263, anon1267, and anon1275 are also in the room. You may type /help for a list of available commands. Also, please respect the chatroom rules which are: No swearing, name calling, racism, offensive language, or offensive symbolism allowed. No spamming allowed. Repeat offenders may be muted, kicked, banned and reported to the admin.